Advancements in technology are progressing at such a rapid pace that it is almost impossible to keep up with all the new gadgets out there. And a lot of these gadgets are making communication almost instantaneous, bringing people closer together and making the world a much smaller place. In recent blog entries we have discussed the relation between technology and religion, a continually evolving topic of debate. Not only is there a smartphone software application for Jesus, but there is now one for the Bible as well. For better or worse, communication technology is making religion much more efficient and accessible, and congregation members much more interconnected than ever before. Software engineers at Apple, Inc., now offer a “Holy Bible” application for users of iPhone, Apple’s version of the smartphone. However, some church-goers have difficulty integrating this new technology into church activities—almost like children, they find it difficult to focus on church sermons, their eyes glued to the new features available on their Bible app. One such person is Wade Harris, a parishioner at Metropolitan Baptist Church in Newark, New Jersey. Christina Tsuei of The Wall Street Journal quotes Wade as saying, “[s]ometimes I have the phone in the middle of my Bible”, adding, “[m]y wife will actually take my phone from me and put it in my purse”. For some, these convenient new software programs distract the parishioner from the actual message of the sermon. But religious smartphone apps are not necessarily some silly distraction—they can also serve as a convenient device for reference purposes and for communicating religious messages through the Web. Smartphones are now a normal part of everyday life for people in wealthy countries, and this by no means excludes the pious lay-member. Traditionally, priests and pastors would ask their parishioners to refer to Bible verses in actual books to help clarify their message behind their sermon. 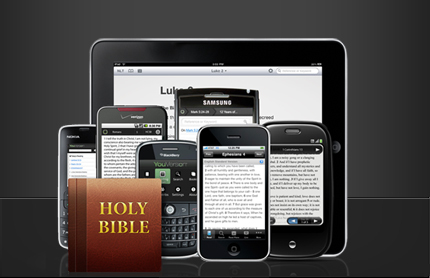 Bible apps are no different—they are just the holy book of the Christian faith in electronic form. Just as they used to turn to worn Bibles with densely-annotated margins as a way to illuminate the minister’s message, they now press a couple of buttons and retrieve the relevant passage that way. In both cases, they are looking up material that relates directly to the sermon. Of course, to be fair, smartphones are not exactly the same as books, and there are some drawbacks to bringing your high-tech gadgets to church. The chief problem with smartphones is that they allow you to do so much on one, single device—and this includes tweeting. Yes—some parishioners are caught red-handed posting the priest’s sermon on social network sites such as Facebook or Twitter—before the sermon has even ended. (Now we can probably understand why Wade’s wife prised his phone from his hand and deposited it into her handbag.) So, while tweeting may render more efficacious the spread of the gospel (or any other religious doctrine, for that matter), it is probably wisest to reserve this activity for the chit-chat following the sermon. Just as the invention of the printing press in the 15th century made religious material available to more people than ever before (and may have contributed in part to the Protestant Reformation a century later), so are emerging innovations in communication technology. In both cases, the inexorable march of progress inevitably subsumes the most intimate and familiar aspects of people’s religious lives, changing the way we practice our spirituality. Now, every literate person with Internet access can treat religious doctrine in a critical light. As an individual who has become an ordained minister online, what do you think about innovations like the Bible app? How are they affecting your personal religious and spiritual life, and is the change ultimately for the better?